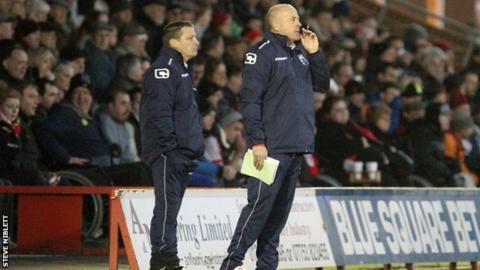 Hereford United manager Martin Foyle and his assistant Andy Porter are set to sign new two-year deals at the club. The pair took over in the summer of 2012 following the team's relegation from the Football League and the side's board is keen for them to stay. Foyle confirmed to BBC Hereford & Worcester that "everything has been agreed" but not yet finalised. He added: "It's been a tough time but we're looking forward to running the club for the next two years." Hereford, unbeaten so far in 2013, stand 11th in the Blue Square Bet Premier table, having drawn their last three matches since starting the year with victory over in-form Kidderminster Harriers at Aggborough.